Sneak a little devilish holiday magic onto your Christmas tree with this Lucifer ornament. This glass ornament is embellished with glitter. If you prefer your devils a bit more cheerful, here's a Roly Rascal devil ornament by Christopher Radko. This glass ornament depicts Krampus, the German devil. 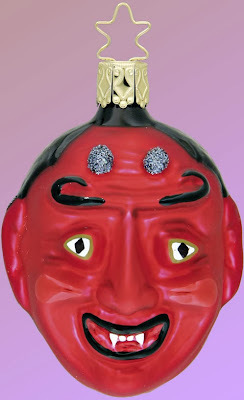 This devil ornament features stubby demon horns and a cool mustache.